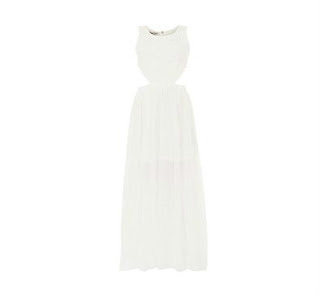 GotToLove♥: War of the White Dresses. Now, it's nearing the Summer and we are finally getting a peak of the very delayed Spring, so we are being bombarded by pale dresses at a frail attempt to show of any slight tan. 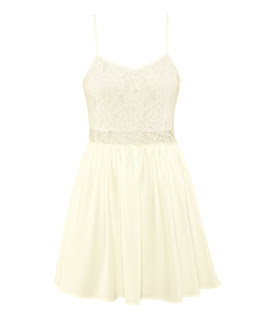 I love a pastel coloured dress but I'm having a greater addition to white summery ones. They are around everywhere at the moment, I would love to include some from Primark but as they do not have a website I am presented with a problem. So if you're an addict like me then check out Primark! I love basic, fun t-shirt dresses! This Others dress is just so cool -there's no other word for it- just awesome. I would tell you how to style it but I think ASOS have pretty much done what I have done with the styling. Some high-tops with a beanie is just the perfect way to wear for a t-shirt dress. And it's bang on trend with the monochrome looks. This really cute and stylish dress is perfect for a posh barbecue, or just to wear out to shopping by styling it down with a beige across the body bag, a long statement necklace and some beige brogues or gladiator sandals. The cut out detailing just makes the dress more interesting to look at by highlight the slimmest part of your waist. This dress is from Missguided. By now you're probably thinking, 'enough with the cut-out detail!' But that's just the problem I can't get enough of it, this time having the detailing on the shoulders gives it a more elegant feel and contrasts perfectly with the slightly sheer sleeves! It is a little pricey at £59 but it is very gorgeous I may consider paying it! This is from the American shop Romwe, but luckily they do free worldwide delivery, so get on it! I love the dresses with a sweetheart neckline and then a lace high-neck following down the arms, -so obviously this dress was going in the post as soon as I saw it!- What's just so amazing about it is the lace detailing is actually lace daisies which just makes me love it more! It's such a feminine dress, so if you wanted to toughen it up a leather gilet would be perfect. You can get this on Missguided, and while you're there check out this gilet from George! This last dress is very unusual compared to the others, it almost reminds me of a nightie my Grandma would wear, but it pulls it off. Like the previous dress, there is a sort of sweetheart neckline but with sheer sleeves a chest which is very sophisticated. The collar embellished with pearls, I think, takes it across the boundary of a nightie to a really pretty Summers day dress. You can pick this up at ASOS. Hope you liked some of these dresses, becciixx.